Boy did we get a White Christmas! Now I’m not a Scrooge; I love a White Christmas. When we lived in New Mexico, I always missed the fluffy white snow. Down there, all the snow blew sideways and was brown from the dirt in the wind. Here in northern Minnesota we have snow, snow at least! You know the kind that falls nice and fluffy, piling up on the pines and looking like a Christmas card picture. But the weekend before Christmas, it started snowing hard, and it snowed and snowed and it’s still snowing. Last winter we barely had any snow; maybe a foot, total snowfall all winter. Now just after Christmas, we’ve got about eighteen inches on the ground with drifts in some places four feet deep. So we’re shoveling around the chicken coop, snow blowing around the front of the house where we come in, and shoving snow around with our big Ford pickup and snowplow. The poultry thinks it’s fun. David built them some snow caves in the drifts in front of the coop and threw corn in there, then leveled out some feeding areas. The mallard drake we have flies out of the coop and belly flops along the path, quacking happily. 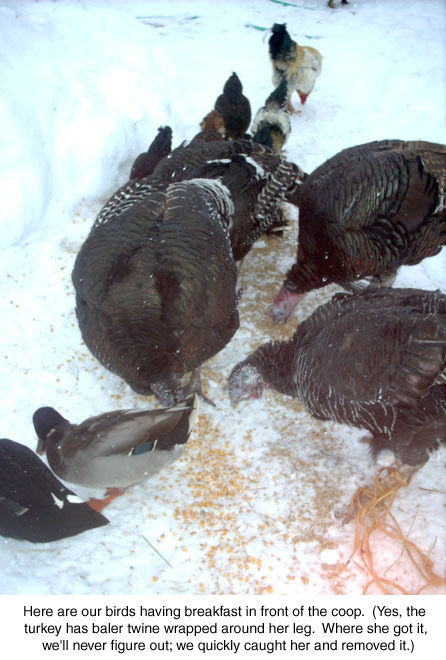 Even our fat turkeys waddle out to peck up the scratch feed before they go back inside. They don’t like the snow and eat fast and go back inside. I’m soaking a big kettle of pinto beans tonight so I can process them in the canner tomorrow. It’s so convenient to have those cooked dry beans on the shelves. We like refried beans and the store ones are so nasty it’s unbelievable. Who killed the taste??? I drain a pint of mine, add to a big frying pan with a tablespoon of olive oil, heat it then dump in the beans and mash them quickly, frying at low temperature. I always add diced onions, a half pint jar of home canned chiles and fry them up nice and dry. Now THAT’s refried beans! The winter’s snow makes me want to have a pot of stew simmering on the stove, a few loaves of bread rising on top and some tortillas and beans for lunch with homemade salsa to top them. So who’s worried about winter???? Pass the sour cream. It’s Elly Pllips, your editor at Rodale for the Veterinary Guide update lo those many years ago! I was thrilled to discover your columns in Backwoods Home and have followed them avidly for years. home place, Hawk’s Haven, when we were still in touch, but I too have chickens (and many indoor animals) and a greenhouse, as well as my partner Rob, who’s so sweet and considerate. I have all fingers and toes crossed for you in that regard as well–God knows, if it could happen to me, it can happen to you!!! Anyway, I’m freelance editing and writing now, and have been really enjoying working from home with my golden retriever Molly and the cats keeping a watchful eye on me as I pound away on the computer. I’ve been meaning to write you for ages, but was finally pushed to do so by your mention of ‘Dragon’s Tongue’ beans in the latest BHM issue. I enjoyed those beans for the first time this past summer and they were the best I’d ever had! I can’t tell you how many beans-rice-and-sliced-tomato suppers I enjoyed while I was picking bagsful. Yum!!! I wish I’d had your mustard pickle recipe when I was picking more than even I could eat fresh (even with Rob’s help!). Next year I’ll know what to do. Anyway, thanks more than I can say for enriching my life and those of all the BHM readership by sharing your experiences and wisdom. What a gift!!! Yes, I do remember you and our work on the Veterinary Guide re-write for Rodale. No, you didn’t have your new place yet; congratulations!!! We lost Bob to a massive brain hemorrhage in the middle of the night, suddenly with absolutely no warning. It still doesn’t seem possible. As you know, we’ve kept on and have accomplished much in what I think is a short time. I have been writing to a sweet guy in Washington state for over a year now, so who knows what the future might hold? Good things, I hope! Glad you liked the Dragon’s Tongue beans. They’re among my favorites and I sure use them for a lot of different recipes. Crops that produce like that AND taste great always get planted again and again here. Have you tried Hopi Pale Grey squash yet? It’s another huge favorite! Both Seed Dreams and Baker Creek Seeds sell them this year. I’m so glad because it’s almost extinct and that’d be such a shame. A cure for a sick goat? I wanted to make a comment and ask your opinion on the blog from Michelle Chapin from Fresno, Ohio. I read about her goat and I was saddened. And you said that there is no cure. I do a little studying into natural herbs and the medicinal properties they carry. I just wanted to throw out a few ideas before Michelle butcher’s her sweet little goat. I’ve learned that Fresh Basil is an intense infectious bacterial killer because of it’s volatile essential oils. It also has anti-inflamatory properties making it great for arthritis sufferers. Please refer to this site : http://www.indepthinfo.com/basil/health.shtml I also have researched Cayenne pepper and it is said to be a miracle cure all! You can get cayenne pepper in a pill form so it does not burn the animals mouth. And the last thing I have been researching is magnet therapy. The magnets are said to increase circulation, and reduce pain significantly!! Especially for arthritis sufferers. Maybe Michelle can wrap these around the goats joints and see what happens?? I truly believe these things can work for her, and I would hate to see her give up because a “medical vetrinarian” might tell her there is no cure. God has given us all the tools we need to survive and heal ourselves, and I believe her little goat deserves a second chance to frolic and be happy. Sorry, but I’ve tried about every herbal remedy known to man, ancient and modern and have never saved a goat that had CAE. This is a very serious and contagious disease. Once the goat’s knees are affected, the arthritis is severe; you can’t even force the knees to a straight position. And this seems to progress very quickly to that point; by the time you realize there is something wrong, it’s too late. I raised hundreds of goats in my life and quickly found out that prevention is a whole lot more successful than treatment. Will creosote leach into plants? I read in your last issue that you use railroad ties for your raised bed gardens. Do you think there is any harm in the creosote in them leaching into the dirt and plants?